Critics attend a popular opera such as “Tosca” many, many times over the years. We saw it here just four years ago, with the amazing Lianna Haroutounian in the lead and tenor Brian Jagde as her beloved, Cavaradossi. 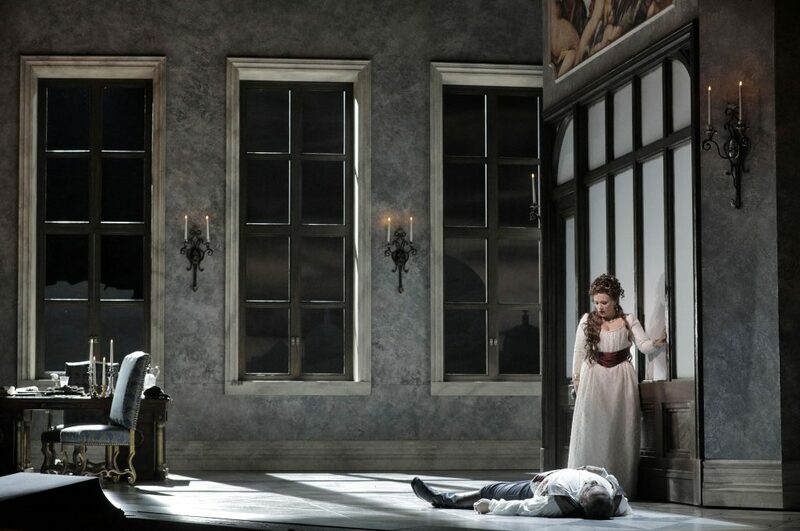 This is my third “Tosca,” so it was impossible to see even the new San Francisco Opera production with fresh eyes. It was, though, the first-ever opera for my friend Emi, who wanted to understand why so many people love the form. 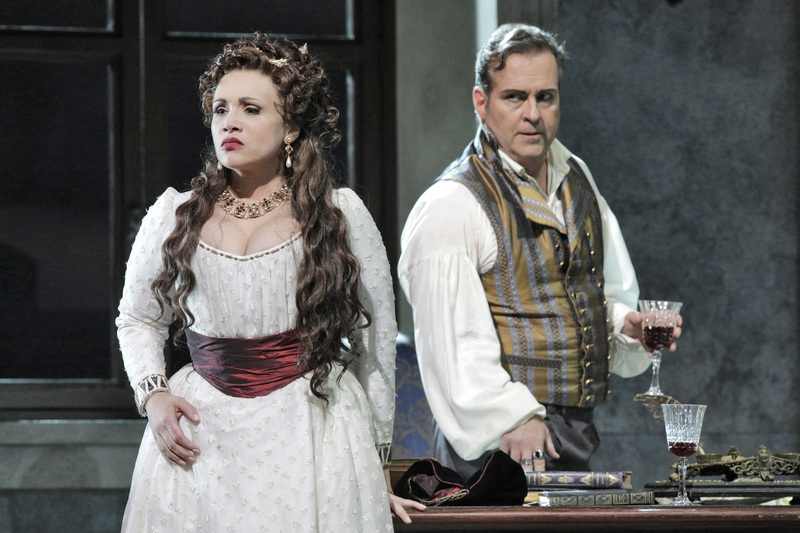 The excitement of this “Tosca” is the much-anticipated debut of soprano Carmen Giannattasio (dubbed the “Lady Gaga of opera” by Placido Domingo) in the leading role. Giannattasio waited until her voice had the richness, color and maturity for such a strenuous part. In the first act, where she must veer from devout to coquettish to insanely jealous to passionately in love, she was tender and soft (while reaching all 3,300 seats in the War Memorial Opera House) in her duets with Cavaradossi (Jagde again). Both soared majestically over that act’s too-loud orchestra (conducted by Leo Hussain). 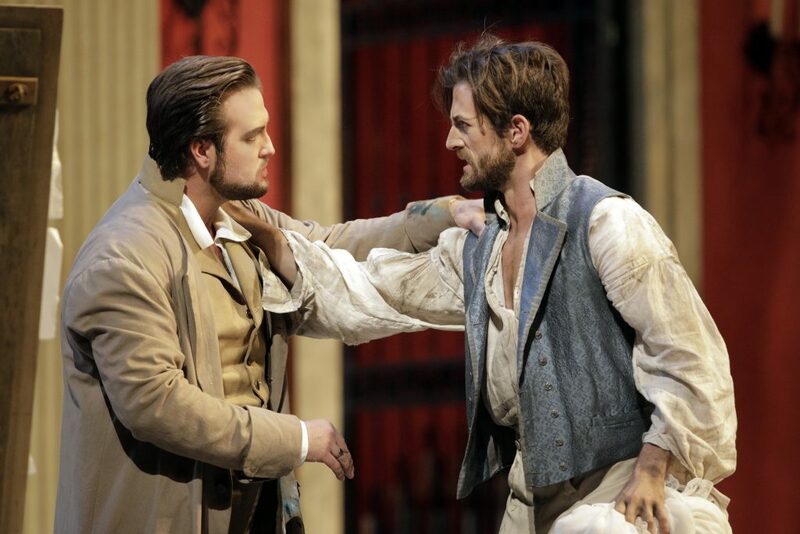 Jagde brings ardor, vocal agility, and a relaxed naturalism to his Cavaradossi. But this is our third time seeing him in this role, so after Giannattasio, longtime operagoers were most interested in the new sets and costumes. (Opera is such an expensive endeavor, the old ones were used for decades.) 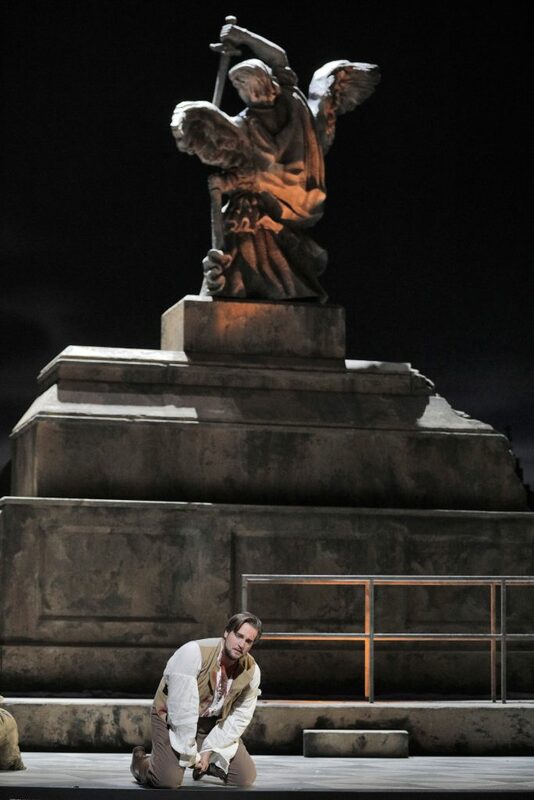 Each act of “Tosca” is set in a real building in Rome: a church, an official’s apartment in the Palazzo Farnese, and on the roof of the Castel Sant’Angelo, which houses a prison. The new sets, created by Robert Innes Hopkins, are suitably grand but little different from the massive realism of the retired ones. And there’s been no reimagining of story or approach. It’s still set in 1800, and as the opera begins, Angelotti, consul of a failed Roman republic, has just escaped from prison to the church where Cavaradossi is painting. Friendship and patriotism spur Cavaradossi to help him escape from Scarpia, Rome’s corrupt police chief, and his minions. Scarpia is also a sexual tyrant, who likens women to wine and he wants to taste them all. 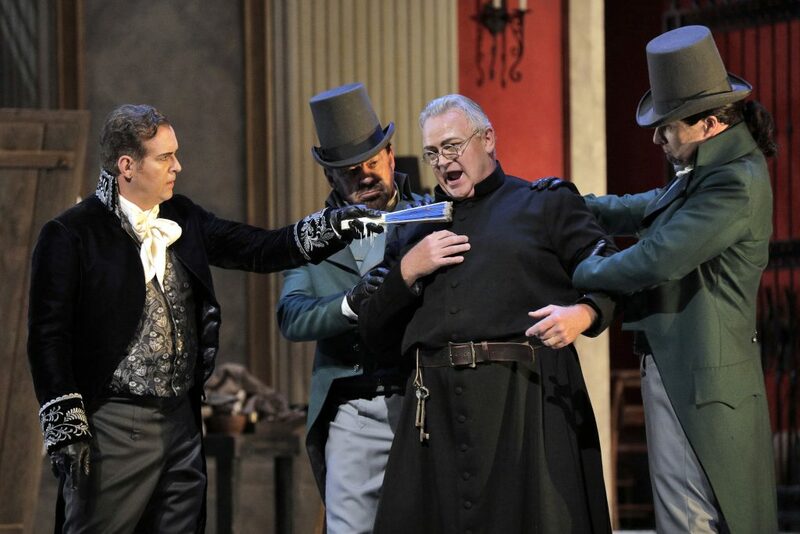 In Act Two, he has captured and is torturing Cavaradossi within Tosca’s hearing. He tells her that he’ll let her lover live if she gives herself to him. When she finally, painfully, agrees, he promises the “fake execution” we will see in Act Three. Since this is opera, you don’t need to be told that things do not end well. We used to have no trouble accepting stout older singers as the starving artists in “La Bohème,” for instance, if they had glorious voices. It’s only been in the last decade or so—perhaps since opera performances are filmed and you can watch them in a movie house—that we’ve wanted our singers to be good actors, too. Cast: Carmen Giannattasio, Brian Jagde, Scott Hendricks, Hadleigh Adams, Dale Travis, Joel Sorensen, Andrew Manea, and Christian Pursell. Banner photo: Carmen Giannattasio and Scott Hendricks.